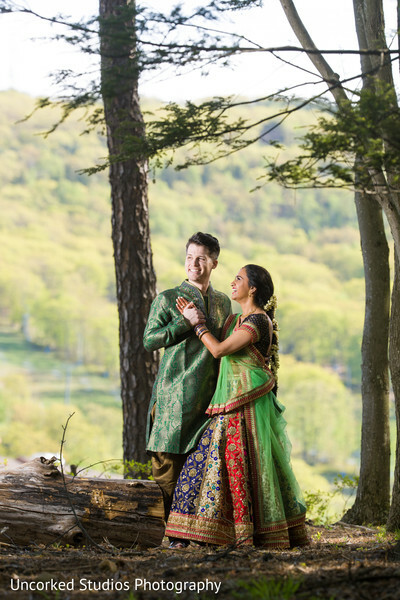 This fairytale wedding begins during a chance encounter at the Children's Hospital of Pittsburgh UPMC where Matthew admired Jaya’s Chuck Taylors and the rest is wedding bliss history. If you are swooning for the cutest proposal, read on below for the details! 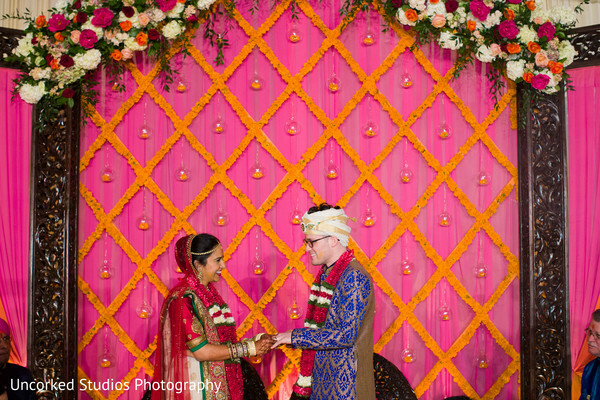 Maharani Jaya knew that she wanted to be different than most Indian brides for her fusion Indian ceremony. 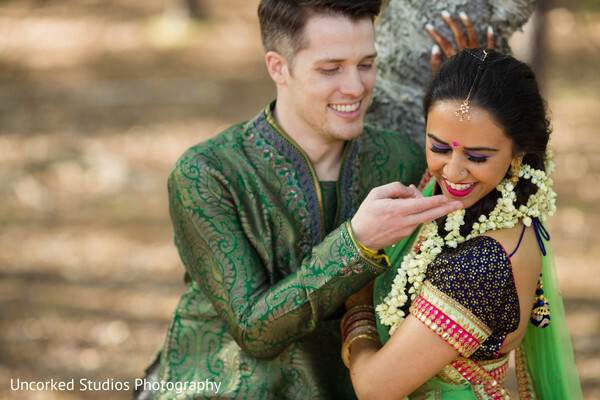 She traveled all the way to India to find the perfect bridal attire for her diverse fairy tale event. On her garba night she wore a traditional green patchwork chanya choli. 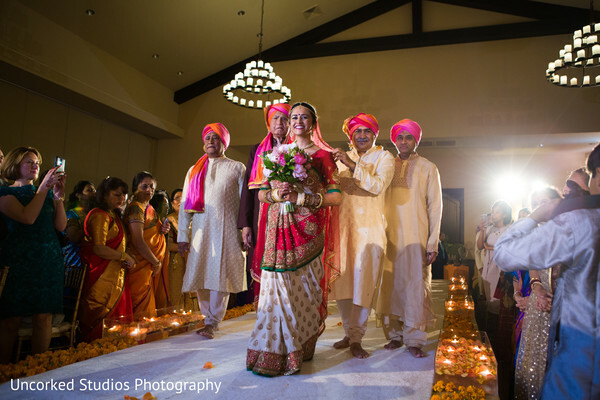 Keeping up with tradition, the bride opted for a distinct Gujarati panetar saree for her Indian ceremony. The bride had her personal glam squad with close friends Fawn Monique Dellavelle on makeup duties and hair by Kirsten Bonilla of Shear Brilliance. The ethereal combination of pink and orange served as the backdrop for a whimsical mandap designed by Elegant Affairs for the perfect wedding stage at the Camelback Resort. Event planner Shayosa Events coordinated the picturesque set of fusion events for Maharani Jaya’s dream wedding. 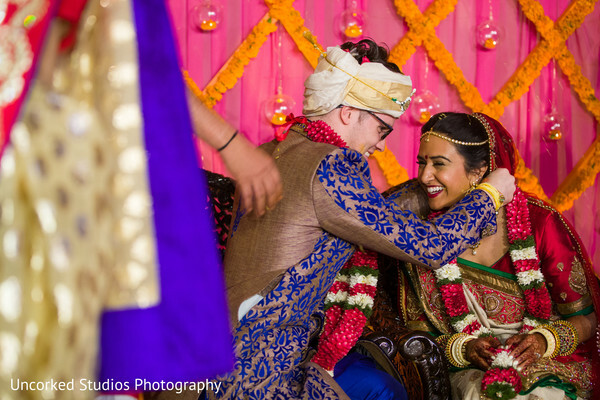 Another element of this fusion wedding that I absolutely adored is Matt incorporating Jaya’s family dog, Burrfi, in the wedding proposal! We can tell this is one fun wedding event and are awaiting the film that was captured by Ambrosial Films. All the images you can find in the gallery were shot by Uncorked Studios! Bravo! I was flying back from a vacation in LA to Pittsburgh to attend Matt's friend's wedding. We also planned that our parents were going to meet for the first time that weekend -- my parents were going to drive up from the Poconos to meet his family. After a successful meeting, my family and I were at Matt's house getting my things ready because I was going to stay with them in a hotel on the other side of Pittsburgh. We also had Burfi, my mom's dog, with us which was hysterical because she had surgery on her paw and was miserable and had to wear a cone; she was not happy. But I was running around getting my stuff and Burrfi's stuff together while my mom, dad, brother and Matt plotted on what was going to happen next. Matt went to talk to my dad, my dad deferred to my mom and my mom excitedly said, "You're going to propose tonight!" It was an unseasonably cold night for the end of March, and I was not prepared for it at all but for some reason, my brother said, "Let's go to Mount Washington and see the Pittsburgh skyline. I know that you lived up there in college, and I never got to visit you so let's go see what it's all about." I said okay, even though I knew it was so cold. I got in the car with my parents, Matt drove his car with my brother and Burrfi and we made our way to Mount Washington. My dad was acting a little shifty, and my mom kept saying what a beautiful night it was and how amazing the skyline looked. In my head, I didn't understand it because they'd visited me so many times, I didn't know what about this night made it so special. Matt parked the car on Grandview Avenue, near one of our "benches". When I lived in Pittsburgh, I lived a block away from Grandview and you could see the entire skyline from there and in the summer the Pirates would shoot off fireworks (win or lose), so I loved to go up there with some icecream and just watch the fireworks with Matt. It was my favorite thing to do. So I got out of the car, was showing my brother where I used to live and Matt said "Let's show them our bench." I was already about 15 feet ahead of him walking towards our bench -- I got there and sat down and I turn around to see where my family is and I just see Matt launching at me with a box in his hand. I said, "No, this isn't real, is it? Are you sure? Did you ask my dad? Is everyone on board? Are you sure? Is this real?" My mom was crying, my dad was covering his ears because it was so cold and he didn't have a hat, Burrfi was trying to jump on us because she didn't understand what was going on, and my brother was trying to take pictures, all while Matt was trying to ask me to marry him. It was the most perfect proposal -- it captured our personalities and dynamics and I wouldn't have had it any other way! 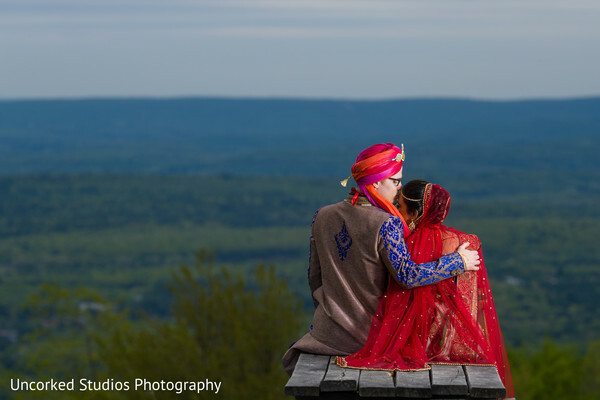 I grew up in the Pocono Mountains in Pennsylvania, and it was really important to me to get married close to home. My husband and I are both from Pennsylvania, so getting married anywhere else like New Jersey or New York just wouldn't have felt right. My best friend, her mom and my mom ended up finding our venue, Camelback Lodge, in Tannersville PA. Funnily enough, it was a brand new venue adjacent to the ski slopes my brothers and I grew up going to as kids. 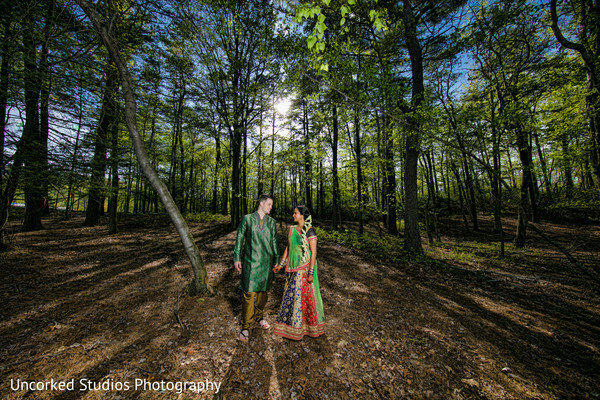 I knew right away that I wanted to get married there, and they thankfully were ready to take on an Indian wedding! My hair and makeup choices were easy -- I'd always known who I wanted to do that for me, it was just a matter of seeing if they were available for our big day. My hair was done by Kirsten Bonilla of Shear Brilliance and she's been doing my hair since I was 16 years old. My make-up was done by someone who I've also known since I was a little girl -- Fawn Monique Dellavelle (Fawn and I danced ballet together, and she was the Clara to my Mouse Queen during one of the Nutcracker performances!). I'd followed her work for a really long time, and her looks very aligned with what I wanted so it was a no brainer. My mehndi was a little bit harder to find especially because I am a mehndi enthusiast. I ended up finding Monita Birjoriya on Instagram and contacted her right away so book her for my wedding. I'm so glad I did -- she was so kind, patient, and her work is truly amazing! Our designer, Vikram Panicker with Elegant Affairs was a dream to work with. I didn't necessarily have a specific layout in mind but I did know that I wanted a traditional layout, but in my style. 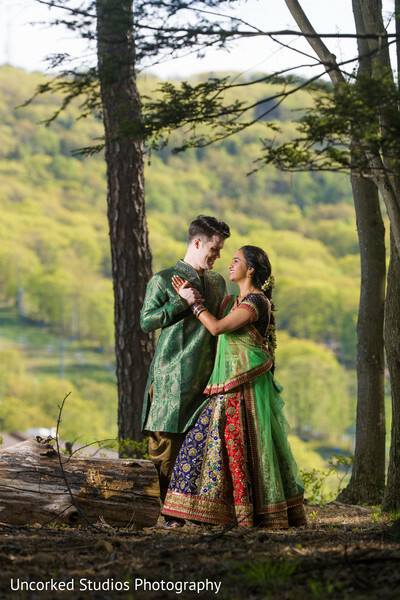 I ended up just picking out our mandap layout, and I told him for the reception I wanted to feel like I was in a log cabin, and I left the rest up to Vikram. I didn't realize what a lottery I'd won until I saw our set up on Saturday morning and again when it was transformed Saturday night. Head on back for the reception party catered by delectable cuisine from our friends at Moghul Caterers. Elegant Affairs Inc., Shayosa Events and Fawn Monique Makeup Studio are members of the Platinum Guide. Love what you see? Explore their portfolios.